Saturday's 1-0 defeat by Bournemouth at the Stadium of Light condemned the Black Cats to life back in the Sky Bet Championship after a 10-year stay and set in motion an inquest which is sure to be grisly and have lasting consequences. 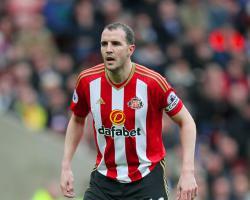 But O'Shea, who celebrated his 36th birthday on Sunday, is urging his team-mates to go down with their heads held high by throwing off the shackles in the final four games of a soul-destroying campaign. We all have to make sure we have that respect first and foremost for the Premier League, for everyone associated with Sunderland, that we finish the league strongly and positively as possible and we get as many points as we can. "Obviously, there will be some very serious situations, other things that haven't been resolved for other teams and we have to have that responsibility to make sure we perform like we have been doing. We have to keep that, keep that positive attitude as much as we can and give the fans something to cheer about." Sunderland's demise was confirmed at the end of a game of little real quality when Josh King capped a fine individual display with a close-range finish to claim the Cherries' first away victory since December 31. With Hull managing a goalless draw at Southampton, only a win would have kept the Black Cats alive, but it was not meant to be. O'Shea is a veteran of the club's great escapes in each of the last four seasons, but he admitted they had simply left it too late this time around. He said: "Look, obviously today was the final defeat that relegates us, but we've had enough games where you think, 'We need to get that win here today' to get us that push, where you think we get ourselves going, but we also get the other teams looking and thinking, 'Oh, Sunderland are at this again, they're going to get on that run', and we haven't been able to do that." Sections of the home fans once again turned on manager David Moyes on the final whistle, although he deflected questions over his future as he prepared to take stock and discuss the way forward with owner Ellis Short, who released a statement on Saturday evening in which he admitted mistakes had been made, and chief executive Martin Bain during the coming weeks. But obviously, we are really disappointed. "We've had a long season to try to out it right - we haven't to been able to do so - but hopefully we can in the future make sure that we correct it." The gloom on Wearside was in stark contrast to emotions within the visitors' camp as Bournemouth broke through the 40-point barrier and set their sights on a top-10 finish. Manager Eddie Howe said: "I think it has to be [the target] for us, yes, finish as high as we can. But we look forward to the games we have."